Recently, we purchased a new travel backpack for our family travels. We had been researching the best travel backpack brands for a while as there are a lot of options. I read various travel backpack reviews in order to decide what would be the best backpacks for our family’s current needs. After years of travelling I know it’s important to ask yourself a few questions before rushing out to purchase a pack. Firstly, you need to consider who will carry the backpack? What will you put in the backpack? Do you need a laptop backpack to keep your laptop safe or will one of the cheap travel backpacks do? Another big consideration is the comfort factor, the best travel bags are usually lightweight and fit your shoulders and back comfortably, so you can get on with travelling without worrying about back and neck strain. Click here to see the best travel backpack now. To save you hours of research, I have compiled this guide to help you answer all these questions. I have gathered information on some of the top travel backpacks from the best backpack brands as well as their various features so you can choose one of the best backpacking bags for your needs. 2 Why and when is it best to travel with a backpack? 3 What to consider in buying the best travel backpack 2019? Why and when is it best to travel with a backpack? A backpacker is not just for young travellers staying in dorm rooms. A backpack is for various types of travellers who want the freedom of having their hands free and not having to wheel a bulky suitcase around. Travelling with a backpack gives you flexibility, when you turn a corner and see a set of stairs or arrive at a hotel with no elevator. A backpack is the perfect type of bag if you travel with children as it allows you to have your hands free to hold a little one’s hands without trying to wheel a suitcase and keep the kids safe. What to consider in buying the best travel backpack 2019? Do you travel light? Are you physically fit? Do you need to carry a laptop or tent on your travels? What else do you need to know when looking to buy? Travel backpack brands offer backpacks for all people and occasions, there is not a “one size fits all” backpack. Whether you are looking for the best hiking backpack, the best daypack for travel or the best backpack for Europe or Asia, it is important to give yourself time to understand exactly what it is you need from a backpack, and the time to find it. These days it is easy enough to buy backpacks online (when considering where to buy travel backpacks I do recommend online as it is usually the cheapest option), but when doing so remember to consider the size. Too small and you won’t be able to fit all your family’s things in, too big and you may have to check the bag in unnecessarily or pay for excess baggage. It is also important to consider who will be carrying the backpack. A tall man and a petite woman have very different frames. I recommend you aim to find the best lightweight travel backpack that meets your needs in all other areas. These days many travellers are opting for carry on only luggage and there are some great options out there for the best carry on luggage backpack. However, there are still just as many awesome bags with various compartments for those travellers who like to bring loads of stuff with them. When purchasing a pack, consider whether you want a front loading or top loading bag. Basically, this means do you want to access your things via the top of the bag or the front. In my view, front loading packs are far easier, they are similar to a suitcase and usually have various compartments making it easy to locate your items. Talking about compartments, when purchasing a new pack, consider what items you will carry and what things you may need to access quickly, and how often. A sleeping bag or change of clothes does not have to be as easy to get to as a rain cover, phone, camera, passport, tickets or laptop. Internal compartments are important too, helping to keep things organised and easy to find when you need them. These days travellers are taking various technology with them and so there are some great packs on the market with compartments designed to keep these items safe. Below in the reviews, there are some great options if you are after the best laptop backpack for travel. These packs have compartments designed to keep your laptop safe and secure whilst travelling as well as easily accessible. Comfort is paramount when purchasing a pack and these days ergonomics are a priority for designers which means the best quality backpacks all come with comfortable straps. A good strap system will spread the load of the backpack across your back, with most of the weight resting on your hips via the hip belt. Some backpacks come with pockets in the hip belt for snacks or small phones. Key features for travelling outdoors are a water-resistant fabric, quick access to rain cover, water and snacks. If you are planning to use daily for work, study or commuting, a reflective strip or option of adding a blinking light might be important for you. There is no one “best backpack in the world”, it must suit your needs. Keep this in mind when choosing and try not to get dazzled by features. If you travel with a laptop, look for a pack with a built in laptop compartment. These compartments have padded sleeves which are designed to keep your laptop safe and secure whilst travelling. Other packs have certain compartments for mobile phones, keys, passports, tickets and cameras. The addition of carry handles give extra flexibility. Carry handles means you don’t always have to wear your backpack on your back, you may be able to stow your straps and carry as a traditional suitcase. Carry handles also aid in putting your back in overhead plane lockers as well as on buses. A water resistant fabric is great for a backpack. It is one less thing to think about if it starts to shower, or you accidentally spill something on you backpack. It gives you that bit of extra time to find cover, or grab your rain cover to ensure your backpack and its contents are protected. This Osprey Travel Backpack is designed to carry loads of up to 25 kg’s. It comes with a detachable daypack complete with laptop sleeve and a scratch free pocket for your eye wear. Made from Nylon Ripstop fabric, the Farpoint 55 is water resistant. The main compartment is accessed via a large zippered panel, which can be secured with locks. The laptop and tablet sleeve is also lockable. Internal and external compression straps allow you to secure items inside the backpack and reduce the overall external size if required. A considered design, the trademark LightWire frame suspension system transfers the weight of the backpack to the hip belt, keeping the strain off your shoulders. A frame sheet spreads the weight across the back. The Farpoint 55 gives you the option of stowing the shoulder straps and hip belt in a zippered compartment, streamlining your baggage for transport. Osprey is a respected brand with good customer service. This is a good pack with well thought out features and comfort in mind. The Kelty Redwing 50 Backpack is a simple backpack with less focus on features and more on comfort. The suspension system for this pack allows for on body adjustments, by loosening all the straps before you put the pack on and tightening them while you are wearing the pack you ensure a customised fit. The main compartment can be accessed from the top zippered panel, or via a larger zippered panel below the compression straps. Padded and ventilated back panel helps to keep you cool while wearing the pack. The padded hydration sleeve doubles as a laptop pocket, so no dedicated laptop sleeve. You can carry tent poles or a fishing rod in deep side panel/pockets. Some reviews have raised a disappointment at the lack of features, for example, no rain cover pocket at the bottom of the pack, no internal compression straps, no lockable zippers. However others rate this pack as the best 50L backpack available so it could be your perfect fit. The Gregory Mountain J53 Backpack is a lightweight pack specifically designed for women. The strap system designed to be comfortable for women, has cutaways on the shoulder straps, a contoured hip belt and padding at the breathable lumbar region. The hip belt has 2 small pockets for snacks or a small phone. 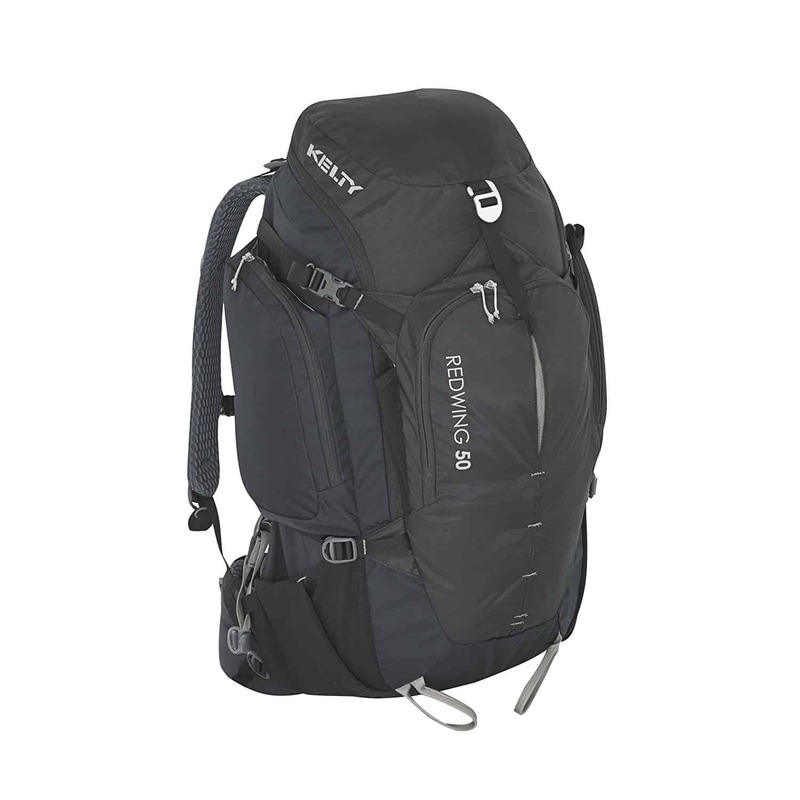 Able to carry up to 20 kg’s, this pack is suited to overnight or weekend trips. The trampoline style mesh covered frame is designed to provide an air gap between your back and the pack, keeping you cooler while on the move. The pack is top loading and has a large zippered panel to access the main compartment. Removable or extendable top pocket, external compression straps and easily accessed rain cover, add to the flexibility of this pack. Great for weekend getaways or for those looking for the best hiking backpack for women. The Osprey carry on backpack is packed with pockets and heaps of space, for a laptop backpack. With a streamlined design and lockable zippers, reviews indicate this is good value for money. Described by Osprey as urban to trail, the Osprey Nebula is sturdy enough for travel, commuting or a sometimes outdoors trip. Key features include a blinker light attachment for cycling at night, a padded laptop sleeve which has separate zippered access, large organisation front pocket and a top grab handle. Mesh pockets are great for quick access and a visual recognition, this pack has incorporated these at the sides and front and within the organisation pocket. The suspended mesh ventilated back panel keeps you cooler by creating some airflow between you and the pack. The removable hip belt gives you more options. The hanging padded laptop sleeve keeps your laptop off the ground and close to your back for a more comfortable carry. The Osprey Nebula is a great choice for those looking for the best small travel backpack. The Swiss Ruigor 6147, sounds like a weapon! Not surprisingly this Swiss designed backpack is almost intuitive in its design. Three zippered top openings give enough room to see what is in each compartment without being too big. The front organisation pocket includes small to medium pockets for pens and notebooks, a small zippered mesh pocket and key hook. The middle compartment is perfect for books or folders. The laptop sleeve located in the back compartment accommodates a laptop or tablet up to 15.6 inches in size. Considered ergonomics, this pack has a breathable padded back, assisting in cool comfortable wearing. Earphone port, reflective strip, safe pocket and glasses hook complete this backpack. 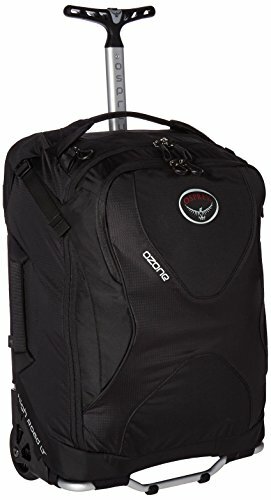 The Osprey carry on travel backpack has direct access to the laptop sleeve and gives you the option of purchasing Osprey’s trademarked Handle-It system to create a roll on luggage system, making this one of the best carry on backpack for international travel. The Ozone Ultralight is made up of three main compartments, the front organisation compartment, main compartment and lower compartment. The front organiser pocket has a zippered pocket hidden inside, the main compartment includes a padded laptop sleeve and the lower compartment has been designed for shoes or camera gear. Upper and lower compression straps help to keep items secure inside the pack, while ventilated harness and hip belt aide in keeping you cool, and can be stowed away. The stretch mesh pockets on either side are for bottles or sunscreen. This pack has standard features presented well. If you are looking for a backpack that is a little bit bigger with an option of using the roll on luggage system, this is a great choice. Not sure if you will need a backpack, or an extra backpack on your next journey? The Outlander Packable Lightweight Travel packs down to the size of a big burger when empty, so you can pop it in your main bag in case you need an extra bag during your travels . This 35L backpack has a lifetime warranty, is made from rip proof water resistant nylon and comes with a free carabiner. A focus on durability is in Outlander’s interests keeping warranty claims down, reports that despite the price and packable feature, that this backpack is durable. The simple design has a main compartment, a small front pocket and 2 side pockets for water bottles. The main compartment opens with a zipper in a traditional “U” shape to access the inside of the backpack easily. The small front pocket is also zippered designed for keys and wallet type items. This is a good daypack option, big enough for snacks, camera, book, and more. A reasonable price and a great warranty. We have this backpack ourselves and use it often. It is perfect for an extra day pack when we travel. The Osprey Farpoint 70 travel backpack comes in 2 sizes, s/m 67L or m/l 70L and includes a daypack. Even better, it comes with a lifetime warranty! Not classified as lightweight, this size backpack is for a longer trip, or a trip that requires a bit more gear. The inclusion of the daypack, easily zippered off the main pack, means you can carry minimal weight with you while you explore, and has a designated laptop sleeve. Made from durable fabric, stow away straps for travelling, internal and external compression straps, padded handles and plenty of internal and external pockets. This pack is a solid choice for travelling. 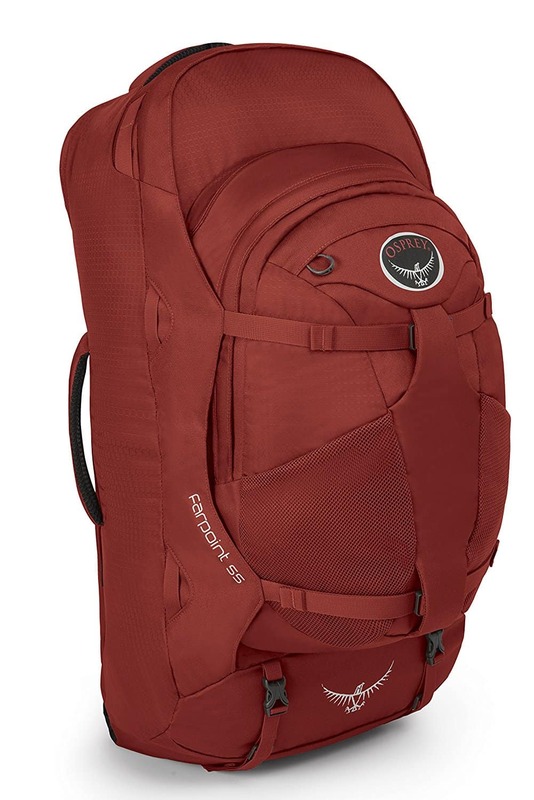 The Kelty Redwing 44 Backpack is perfect for those who travel light and includes a padded hydration or laptop sleeve. Upper side pockets and front pocket with organisation panel for small items you want to access regularly. Stretchy lower side pockets are great for water bottles, and a stash pocket at the front of the backpack is secured with a hook only for storing and grabbing a jacket or jumper quickly. The main compartment can be accessed from the top of the pack via a small zippered panel, or similar to a suitcase opening, when the backpack is laid on its back, almost the entire front panel can be zipped open. A simple design to spread the load across the back and onto the padded hip belt, this backpack is as comfortable outdoors as it is on a flight. My husband has this pack and is a fan. It requires extra postage as it needs to come from the US but we found it worth it as this is a quality backpack from a great price that holds as much as possible while still being fine to bring onboard as carry on luggage. The Osprey Women’s Aura 50 AG Backpack is a large pack and is receiving great reviews with regards to its comfort factors. With a focus on designing a comfortable, larger sized pack for women, Osprey have delivered. A trademarked AntiGravity suspension system and curved design, the Aura 50 transfers the weight easily to the comfortable hip belt. This is so important for a pack this size. It is no good wearing this on day 1 of a 10 day trip and realising your neck and shoulders are paying for it. The harness is adjustable while you are wearing the backpack, and the hip belt has pockets for snacks, phone or sunscreen. Plenty of pockets without being confusing, compression straps, lockable zippers and bottom sleeping bag storage. This is a big pack that is well designed. If you are needing a bit more space and comfort is high on your priority list, this might be the backpack for you. The Kelty Women’s Redwing 40 has been designed for women to take on short to medium length trips or for those that travel light. Womens specific waistband and shoulder straps are contoured for comfort. A classic Kelty design, standard features included are the upper and lower side pockets, which can be used to store long items such as poles, or fishing rods. Considered design keep straps tidy while in use and you have the option of removing the hip belt completely. The suspension system is ridged and light, and the straps and back panel are padded and meshed for cooling. However, this pack is sized, the shoulder straps are non adjustable, only accommodating torso’s 14-18 ½ inches in length. Versatile enough to take on a plane or into the outdoors, this small to medium sized pack is a great addition to the Kelty range and one of the best 40L backpack options. I own this myself and love it. I take it onboard all flights as carry on luggage yet it holds so much. I am able to take all my own luggage as well as the family’s toiletries, my laptop in the back insert and a huge bag of nappies as well. It’s always super comfortable and I highly recommend it. Read about the best carry on luggage and other travel related products here.